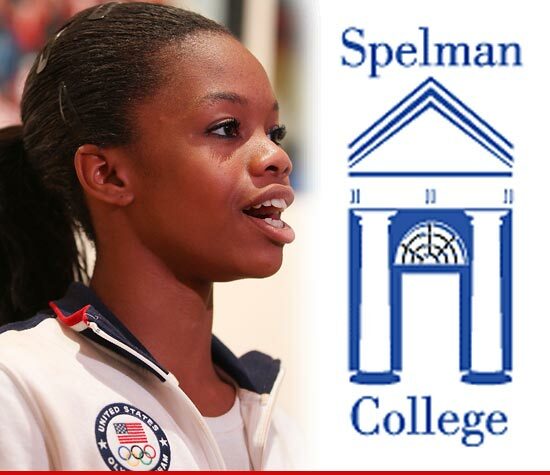 One of the most prestigious colleges in the country has its eye on Olympic gold medalist, Gabby Douglas. That college is none other than Spelman College. The president of the Historical Black College and University (HBCU) flew out to London to personally recruit the young woman and give her a gift bag from the college. We’ve learned … Spelman — an all-girl college in Georgia — wants Gabby in a bad way … and sources at the University tell us the Team USA gymnastics superstar has become the number 1 recruit … by far. In fact, the President of Spelman, Beverly Daniel Tatum, went out to London and made sure Gabby got a Spelman gift bag … containing a congratulatory note, school t-shirt and a CD containing a song produced by the college. I don't think Spelman has a gymnastics team, but I'm sure Gabby would benefit greatly from attending the prestigious institution. That's some love for ya! Travel all the way to London to make their interest known. After winning the ultimate, I'm not sure of the advantage of competing on a collegiate level. I'm sure she will be on tours making money. Plus I think that gymnasts are in their prime during their teen years. I would think she would be able to go to school and just be a student. That and with her getting endorsements, I'm sure she wouldn't be NCAA eligible to compete. Spelman is a great supportive school. She will need good people in her corner. Not that my opinion matters in her school choice, but I don't think she'd go wrong with Spelman. That's not Dr. Tatum in the picture. Kim, thanks for the correction. Dr. Tatum has tweeted that she came to London for the Olympics (not to recruit), but came prepared with a gift for Gabby. That being said, I hope Spelman is at the top of her list! She's a Spelmanite in the making!